Kuwait-based Al Hamra Real Estate Company has joined hands with the Ministry of Youth, Al Rai TV, Grand Cinemas and Light Bug Media Productions to launch a one-of-a-kind girls empowerment programme ‘Sout Afkari’ in the country. ‘Sout Afkari’ is a series of value-driven edutainment episodes which will run on Al Rai TV and social media. The episodes will feature prominent Kuwaiti women from all walks of life, female role models, and social media influencers. The programme, which enjoys the exclusive media support from Al Rai TV, has been launched in partnership with the Ministry of State for Youth Affairs and Grand Cinemas. ‘Sout Afkari’ is produced by Light Bug Media Production, an international award-winning Kuwaiti company led by Yarub Burahamah. The programme, which kicked off yesterday (December 1), will run fourteen episodes, every Saturday at 8:45 pm, till March 2, 2019.
regarding young girls - beauty, identity, love, self-worth, talent, power, and career, said a statement from the Kuwaiti real estate group. These informal educational episodes are designed to encourage critical thinking on issues pertinent to the Kuwaiti youth and positively influence teen culture, it added. 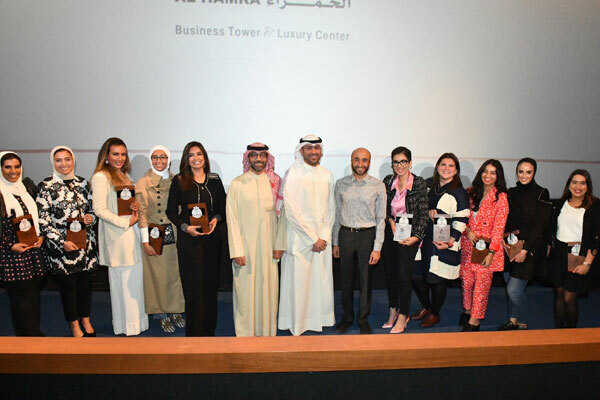 Al Hamra aired the premiere of the first episode titled ‘You are Beautiful’ at the Grand Cinemas located in Al Hamra Luxury Center in the presence of media, influencers, program partners and female role models. Tens of distinguished Kuwaiti women came together to discuss what constitutes beauty, delve into the importance of self-acceptance, raising confidence levels in young women and encouraging fresh thinking. Addressing the gathering, Abdullah Al Mansour, the marketing and public relations manager at Al Hamra Real Estate Company, said: "We are delighted to be pioneers in championing girls’ empowerment in this new modern format together with such inspiring and accomplished women and partners." "Teenage years are universally known to be challenging for the adolescents and their parents and we wished to provide a high quality, informal platform to encourage new thinking in a safe and dynamic atmosphere, leveraging the power of social media and role models to appeal to the young girls," he noted. Nasser Al Arfaj, the director of Public Relations and Marketing at the Ministry of State for Youth Affairs, said: "This is a powerful initiative to inspire young girls to become confident women. The private sector has a significant role to play and it is encouraging to see so many key players come together in support of youth." Nearly 30 Kuwaiti accomplished female leaders, social media influencers and role models in various fields came together to share their thoughts and experiences at the event, said the statement. The list included Dr Khloud Al Najar, Areej Al Kharafi, Rahaf Al Enzi, Engineer Zainab Al Qurashi, Dr Reem Dashti, Manayer Al Kandari, Sara Al Amer, Dr Shaikha Al Jaseem, Asrar Al Ansari, Nawal Al Azaz, Dana Al Owaisi, Sondos Al Shaiji, May Al Najar, Sherefa Al Jaber, Rehab Al Tawari, Reem Al Edian, Lobna Saif Abbas, Dalal Al Doub, Haya Al Omar, Razan Almarshad, Nouf Al Ali, Sherefa Al Sleti, Dana Mado, Rahaf Al Enzi, Aisha Al Abdullah, Khadija Al Haramy, Engineer Abrar Al Ebraheem, Dr Reham Al Reshidi and Nourah Al Ajmi.